For months now, if you were using a Galaxy Nexus LTE, there were ways for you to cirumvent Verizon’s ridiculous block on Google Wallet. All it took was either a browser trick, a sideloaded .apk, or a custom ROM with the app built in. It was pretty simple, for the most part. As of today, it appears as if Verizon and Google have found a new way to block the app from working on your phone, one that kills off most of the previously working workarounds. 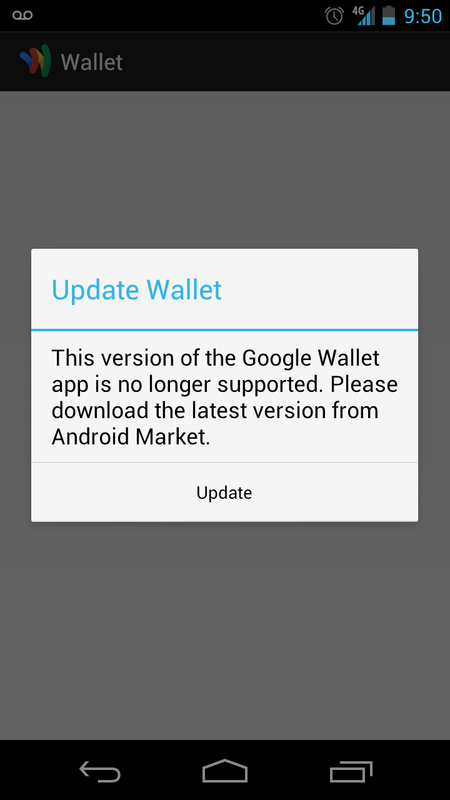 More than a handful of users tipped us off to a new pop-up (pictured above) that mentions something about the Wallet app no longer being “supported.” It then asks that you tap an “Update” button to get the latest version from the Play Store. Of course, once you tap “Update” and head into the store, you are greeted with a message that says that your device is not compatible. Update: Thanks to the wonderful DL community, you can jump right into the comments and get yourself a new and working .apk. Cheers James, Jon, Craig, Andrew, and Daniel! LG and Qualcomm Holding Event on September 19, Ready for a Snapdragon S4 Quad-core?